Silver Coin of Antiochus IV. Obverse: Head of Antiochus as Zeus, laureated. Reverse: ΒΑΣΙΛΕΩΣ ΑΝΤΙΟΧΟΥ ΘΕΟΥ ΕΠΙΦΑΝΟΥΣ ΝΙΚΗΠΟΡΟΥ. Zeus seated on throne, holding Nikē. Tetradrachm of Antiochus IV. Obverse: Head of Antiochus as Zeus, laureated. Reverse: ΒΑΣΙΛΕΩΣ ΑΝΤΙΟΧΟΥ ΘΕΟΥ ΕΠΙΦΑΝΟΥΣ ΝΙΚΗΠΟΡΟΥ. Zeus seated on throne, holding Nikē. (After Gardner, "Catalogue of Seleucid Coins. ")The Tobiads and Oniads. ("the Illustrious"): King of Syria; reigned from 175 B.C. ; died 164. He was a son of Antiochus the Great, and, after the murder of his brother Seleucus, took possession of the Syrian throne which rightly belonged to his nephew Demetrius. This Antiochus is styled in rabbinical sources , "the wicked." Abundant information is extant concerning the character of this monarch, who exercised great influence upon Jewish history and the development of the Jewish religion. Since Jewish and heathen sources agree in their characterization of him, their portrayal is evidently correct. Antiochus combined in himself the worst faults of the Greeks and the Romans, and but very few of their good qualities. He was vainglorious and fond of display to the verge of eccentricity, liberal to extravagance; his sojourn in Rome had taught him how to captivate the common people with an appearance of geniality, but in his heart he had all a cruel tyrant's contempt for his fellow men. The attempt of modern phil-Hellenes to explain Antiochus' attitude toward the Jews as an endeavor "to reform a stiff-necked people" receives no confirmation from the fact that a Tacitus first formulated it. Antiochus had no wish to Hellenize his conquered subjects, but to denationalize them entirely; his Aramean subjects were far from becoming Hellenes simply because they had surrendered their name and some of their Semitic gods. His attempt to level all differences among the nations he ruled arose not from a conviction of the superiority of Greek culture, the true essence of which he can scarcely be said to have appreciated, but was simply a product of his eccentricity. The Jews themselves afforded Antiochus the first opportunity to interfere in their domestic affairs. The struggle of the Tobiads against the high priest Onias III., originally a personal matter, gradually assumed a religio-political phase. The conservatives siding with the legitimate high priest approached the king of Egypt; for they relied more on that monarch than on Antiochus, sometimes nick-named 'Επιμανής (madman), while the Tobiads well understood that Antiochus' favor was to be purchased with gold. The Tobiads caused the deposition of Onias (173), and the appointment of their own partizan, Jason. In order to ingratiate himself with the king, this new high priest established an arena for public games close by the Temple. But the king cared very much more for gold than for the Hellenizing of Palestine, and a certain Menelaus made use of the fact so shrewdly that he received the high-priesthood in place of Jason, in the year 171. But when false tidings came to Jerusalem that Antiochus had died on a campaign in Egypt, Menelaus could not maintain himself in the city, and together with the Tobiads fled to Egypt. 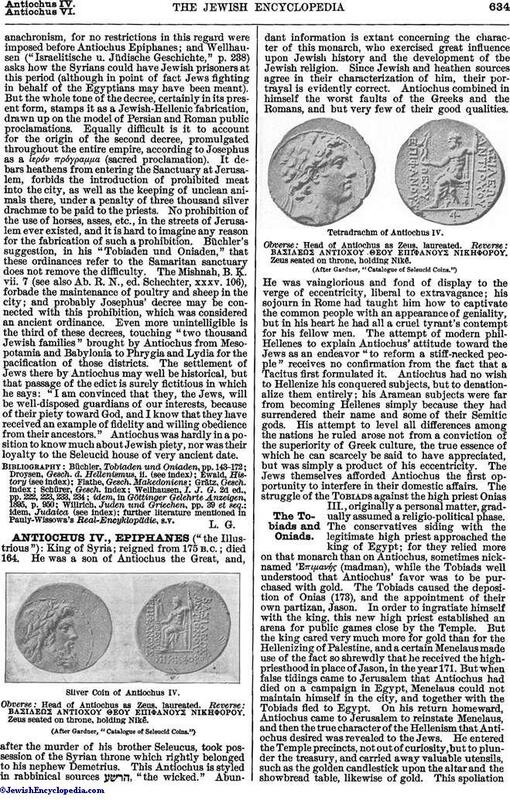 On his return homeward, Antiochus came to Jerusalem to reinstate Menelaus, and then the true character of the Hellenism that Antiochus desired was revealed to the Jews. He entered the Temple precincts, not out of curiosity, but to plunder the treasury, and carried away valuable utensils, such as the golden candlestick upon the altar and the showbread table, likewise of gold. This spoliationof the Sanctuary frustrated all the attempts of Jason and the other Tobiads to Hellenize the people, for even the most well-disposed of Hellenizers among them felt outraged at this desecration. They must have given vent to their sentiment very freely; for only thus can the policy of extermination waged by Antiochus against the Jews and Judaism, two years later, 168, be explained. As long as he was occupied with preparations for his expedition against Egypt, Antiochus had no time for Palestine; but when the Romans compelled him to forego his plans of conquest, his rage at the unexpected impediment was wreaked upon the innocent Jews. An officer, Apollonius, was sent through the country with an armed troop, commissioned to slay and destroy. He first entered Jerusalem amicably; then suddenly turning upon the defenseless city, he murdered, plundered, and burnt through its length and breadth. The men were butchered, women and children sold into slavery, and in order to give permanence to the work of desolation, the walls and numerous houses were torn down. The old City of David was fortified anew by the Syrians, and made into a very strong fortress completely dominating the city. Having thus made Jerusalem a Greek colony, the king's attention was next turned to the destruction of the national religion. A royal decree proclaimed the abolition of the Jewish mode of worship; Sabbaths and festivals were not to be observed; circumcision was not to be performed; the sacred books were to be surrendered and the Jews were compelled to offer sacrifices to the idols that had been erected. The officers charged with carrying out these commands did so with great rigor; a veritable inquisition was established with monthly sessions for investigation. The possession of a sacred book or the performance of the rite of circumcision was punished with death. On Kislew (Nov.-Dec.) 25, 168, the "abomination of desolation" ( , Dan. xi. 31, xii. 11) was set up on the altar of burnt offering in the Temple, and the Jews required to make obeisance to it. This was probably the Olympian Zeus, or Baal Shamem.See Abomination of Desolation. 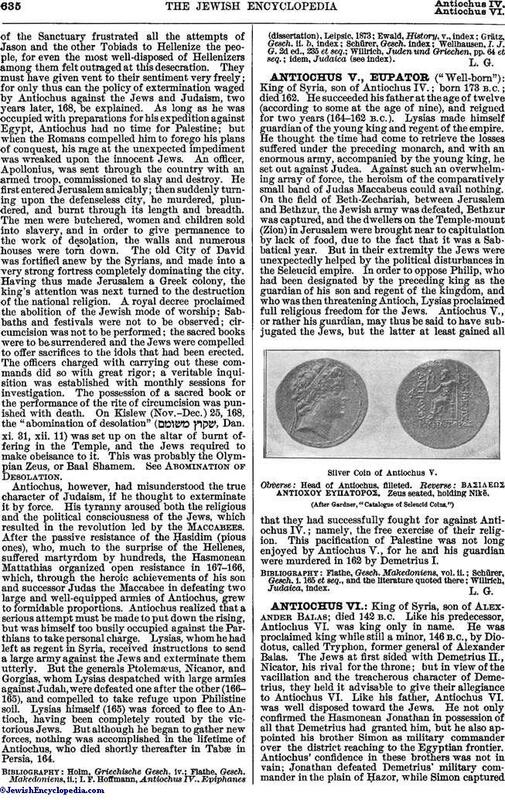 Antiochus, however, had misunderstood the true character of Judaism, if he thought to exterminate it by force. His tyranny aroused both the religious and the political consciousness of the Jews, which resulted in the revolution led by the Maccabees. After the passive resistance of the Ḥasidim (pious ones), who, much to the surprise of the Hellenes, suffered martyrdom by hundreds, the Hasmonean Mattathias organized open resistance in 167-166, which, through the heroic achievements of his son and successor Judas the Maccabee in defeating two large and well-equipped armies of Antiochus, grew to formidable proportions. Antiochus realized that a serious attempt must be made to put down the rising, but was himself too busily occupied against the Parthians to take personal charge. Lysias, whom he had left as regent in Syria, received instructions to send a large army against the Jews and exterminate them utterly. But the generals Ptolemæus, Nicanor, and Gorgias, whom Lysias despatched with large armies against Judah, were defeated one after the other (166-165), and compelled to take refuge upon Philistine soil. Lysias himself (165) was forced to flee to Antioch, having been completely routed by the victorious Jews. But although he began to gather new forces, nothing was accomplished in the lifetime of Antiochus, who died shortly thereafter in Tabæ in Persia, 164.